In the first election for the President, Sauli Niinistö received the majority of the votes cast and was elected the President of the Republic of Finland. The candidate of a constituency association, the incumbent president Niinistö received slightly over 1,874,000 votes in the election, that is, 62.7 per cent of all votes cast. Pekka Haavisto, the candidate of the Green League, received the second most votes (nearly 371,000). Haavisto’s share of votes cast was 12.4 per cent. The difference between the two candidates with most votes cast was thus around 1,500,000 votes and 50.3 percentage points. Niinistö’s share of votes cast was 25.7 percentage points higher than in the first round of the Presidential election in 2012. The support for Niinistö was 42 percentage points greater than the support for the Coalition Party used as his corresponding party in the Municipal elections 2017. In turn, Haavisto's share of votes cast was 6.4 percentage points lower than in the 2012 Presidential election. 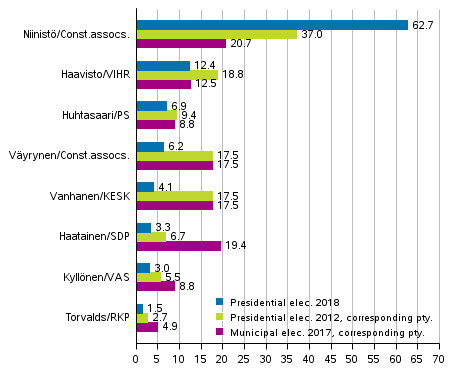 However, Haavisto's share of votes was almost the same (only 0.1 percentage points lower) as the share of votes cast for the Green League in the Municipal elections 2017. The candidate of the Finns Party, Laura Huhtasaari, received the third most votes (over 207,000 votes), which was 6.9 per cent of all votes cast. The support for Huhtasaari was 1.9 percentage points lower than the support for the Finns Party in the 2017 Municipal elections. Paavo Väyrynen, the candidate of a constituency association, received around 185,000 votes and got 6.2 per cent of all votes cast. Väyrynen's share of votes was 11.3 percentage points lower than his share of votes cast in the 2012 Presidential election. Then he was the candidate of the Centre Party of Finland. The candidate of the Centre Party in the 2018 election, Matti Vanhanen, received about 122,000 votes and 4.1 per cent of all votes cast. The difference between the number of votes cast for the party in the 2017 Municipal elections and the 2012 Presidential election was thus 13.4 percentage points. Tuula Haatainen, the candidate of the Social Democratic Party, received the sixth most votes in the election, around 97,000 and 3.3 per cent of votes cast. The support for Haatainen was 16.1 percentage points lower than the support for the SDP in the 2017 Municipal elections. Merja Kyllönen, the candidate of the Left Alliance, had a share of 3.0 per cent of all votes cast, and she received around 90,000 votes. The candidate of the Swedish People's Party, Nils Torvalds, got slightly under 45,000 votes, which was 1.5 per cent of votes cast. The voting percentage of Finnish citizens living in Finland was 69.9 per cent, which was 2.9 percentage points lower than in the first round of the Presidential election in 2012. Voting was more active than on the level of the whole country in the constituencies of Helsinki (71.9 per cent), Pirkanmaa (71.4 per cent), Uusimaa (71.3 per cent), Varsinais-Suomi (71.3 per cent), Vaasa (71.2 per cent), and Satakunta (70.6 per cent). ISSN=2242-3699. 2018. Helsinki: Statistics Finland [referred: 25.4.2019].